Alan Pardew and his backroom staff at Newcastle United have been given massive new eight-year contracts. Coaches John Carver, Steve Stone and Andy Woodman join the boss in levels of unprecedented job security. It's reward for the Toon finishing in fifth-place in the Premier League last season. 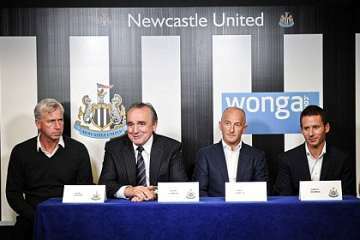 Pardew, Llambias and ... Wonga! Together with chief scout Graham Carr, who's credited with sniffing out undiscovered gems across Europe and will be 75 when his deal ends, Pardew's assembled a squad of all-talents. He's successfully fended off the attentions of Champions League clubs for their best players in the last transfer window. And though that's no mean achievement after the ignominy of relegation under Joe Kinnear and Alan Shearer, there's no need to secure a manager so long-term. 'We're looking to build on the success we had last season and these new contracts are aimed at keeping the club progressing on and off the pitch, as we have done since returning to the Premier League in 2010. 'Alan has done a fantastic job over the last couple of years and has proved what a great Premier League manager he is. 'I have total respect for him in all football matters and have an excellent relationship with him which I think benefits the club enormously. A player awarded an eight-year deal post-Bosman is understandable. But a boss? It'd be logical if upward progress was as predictable as it's been fast for Newcastle in the last two seasons. But football isn't like that. When things come undone, they come undone big time, especially at a volatile club like Newcastle where the gap between expectation and trophy haul is as big a gulf as probably any club in the world. Trouble is there's a thin line between stability and complacency - and you wouldn't begrudge Pardew - or some older members of his management team putting a big cigar on when secured under a huge contract. Pardew signed a five-and-a-half year deal from the get-go at St. James' Park - before he'd earned any lengthy loyalty. It's made still more confusing by the treatment Mike Ashley and the board dished out to previous boss, Chris Hughton who immediately returned Newcastle to the big time at the first time of asking - then stabilised them back in the top flight. He was sacked midway through a season to be replaced by Pardew. No one's arguing with how the former West Ham and Charlton boss has succeeded. The manager of the year's continuing to progress the club. But if and when it goes wrong, it'll be a Titanic and costly turn to a new plan. And in the world of football, particularly Newcastle United, you'd say with near certainty Pardew won't be there in 2020 - either Manchester United and their like will come calling and Ashley will get huge compensation. Or on the balance of probabilities when Pardew's luck runs out, he'll get a disproportionate payoff instead. Ashley's a retail visionary and one wonders whether he's applying unprecedented commercial acumen to the job of running a big club. But football's like no other business. I think he's busking this. A four-year extension for his management team would've served the club better. There's no doubt in my mind that Roy Hodgson's the man to make best use of this pool of England talent - but as I explain in this two-minute podcast, we've made scant progress since losing Fabio Capello. Roy has a Plan A but often struggles when an about-face is required. When grand plans don't come together, great generals resort to a Plan B, but at Wembley, Roy Hodgson's backup looked distinctly laboured. Only a late equalising penalty from Frank Lampard saved England from the ignominy of home defeat to a determined Ukraine intent on revenge. 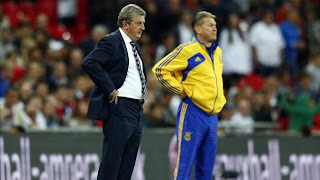 Their disallowed 'ghost' goal against us in Euro 2012 was the easiest motivation possible for coach, Oleg Blokhin. The visitors came out of the traps keen to break us up with pugnacious directness. Skipper Steven Gerrard, who later saw red for the first time in his international career, was deliberately run into by a Ukrainian marker in the early minutes. It's true goals that goals change games and Jermain Defoe's disallowed one would've given the game a whole different outcome had it been allowed. Instead it gave Ukraine their chance. Their greater resolve resulted in a terrific strike from Yevhen Konoplianka and from then on, England struggled with it. The problem of searching for an equaliser came in leaving ourselves exposed at the back. Hodgson's instruction to keep possession exposed our deficit of creativity and imagination. Lampard's great leveller: he leathers it. We missed sitters, struck woodwork and worked hard in front of a patient Wembley crowd, but it's hard to watch England forced to perpetually evolve during competitive games. We don't have the guile of more than one gear. We're not good under pressure. A late penalty can't disguise the lifeless, oft limp show and it's no good blaming the referee for handing out cards like confetti. We know international football's less tolerant on challenges. 1) This early setback's a reminder qualification isn't a formality. 2) Roy Hodgson's still at the drawing board post-Capello.